BATON ROUGE, La. 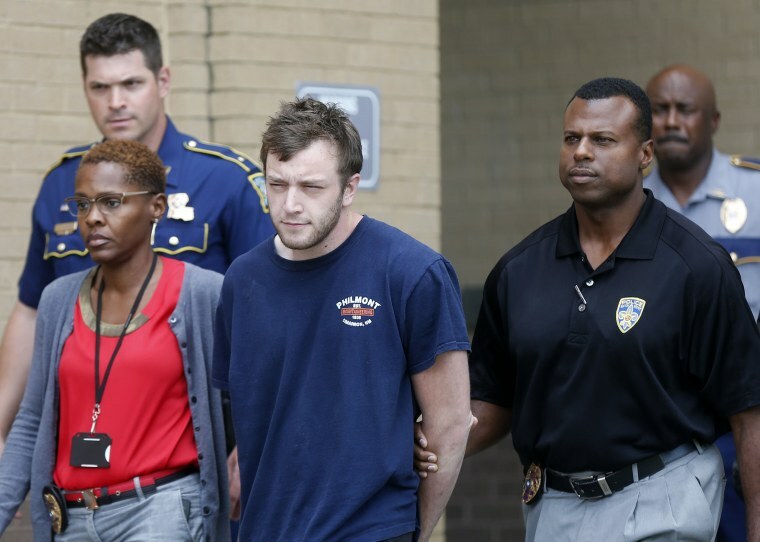 — Louisiana officials on Tuesday arrested a 23-year-old white man accused of killing two black men and firing on a black family, and one law enforcement official said they had found a copy of an Adolf Hitler speech in the suspect's home. The man, Kenneth James Gleason, was led away in handcuffs moments before law enforcement officials announced that he would be charged with first-degree murder in the shooting deaths last week of a homeless man and a dishwasher who was walking to work. "I feel confident that this killer would have killed again," the interim police chief, Jonny Dunnam, said. Authorities found a copy of the Hitler speech during a search of Gleason's home over the weekend, according to one law enforcement official, who spoke to The Associated Press on condition of anonymity because the investigation was ongoing. Authorities say they are looking into whether race was a motive for the shootings. "We're looking at all possibilities at this time, so we're not going to just pinpoint that," said Sgt. L'Jean McKneely. East Baton Rouge District Attorney Hillar Moore said his office could seek the death penalty. No one was injured when Gleason fired multiple times into the home of a black family in his neighborhood, authorities said. It's not clear if Gleason knew the family. Police initially arrested Gleason over the weekend on drug charges, but he was bailed out of jail late Sunday even though authorities considered him a "person of interest." The attacks came at a time when Louisiana's capital already was in the grips of a surge in violence. The number of homicides in East Baton Rouge Parish has already surpassed last year's total of 62, The Advocate newspaper reported earlier this month. "Baton Rouge has been through a lot of turmoil in the last year. Has there not been a swift conclusion to this case, I feel confident that this killer probably would have killed again," the police chief said. "He could have potentially created a tear in the fabric that holds this community together." Gleason didn't appear to have any active social media profiles. A spokesman at Louisiana State University said a student by that name attended the university from the fall of 2013 to the fall of 2014 before withdrawing. He had transferred to LSU from Baton Rouge Community College. During the search of Gleason's home, authorities also found 9 grams of marijuana and vials of human growth hormone, according to a police document.